Built for the Royal Navy and Admiralty Cable Service. Two cable tanks were installed and the cable machinery was supplied by Johnson and Phillips. Only bow sheaves were fitted. 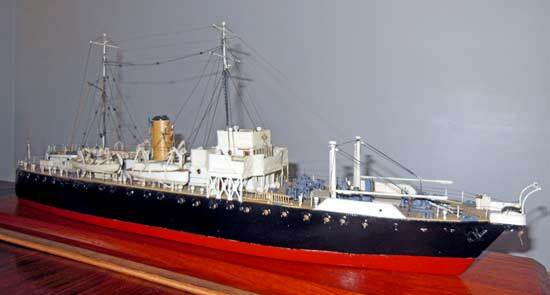 Her prefix changed from HMS to ACS when all Royal Navy cable ships were transferred to the Admiralty Cable Service. Broken up in 1959. On the 18th April 1947 the German fortifications on Heligoland were destroyed, using 4,061 tons of explosive. This was detonated by Commissioned Gunner E.C. Jellis RN from HMS Lasso, lying 10 miles offshore. The demolition team was led by Lt. T.F. Woosnam. My father was John Rattenbury, born in Lyme Regis. He joined the Royal Navy in March 1940 as a Torpedo and Wireman, then was commissioned as an RNVR officer in March 1941 before being promoted Lieutenant in April 1943, serving throughout the Second World War. He served off the East Coast of the USA, the South Atlantic, and the West Coast of Africa on convoy and anti-submarine duties (HMS Wastwater Aug 1942-Jun 1943). He also carried out minesweeping around the UK. He served on cable ships HMS May (Sept 1943-Oct 1943) and HMS Bankville (Oct 1943-Jul 1945), then in the Mediterranean on HMS Bullfinch, HMS Retriever (Aug 1945-Oct 1945) and HMS St. Margarets (Oct 1945-Feb 1946). He left the service in 1946, but returned to sea in the RNVR six months later, and in 1947 he took part in the demolition of German munitions and U-boat pens at Heligoland while serving on HMS Lasso. He left the RNVR in 1952. My father scratch-built the model shown in the photos above while serving on HMS Lasso in 1947. He created a scale model by working from the ship’s drawings and scaling them down, and if he wasn’t sure of anything he just nipped up on deck and had a look. He used card for boats, etc., copper pipe for the funnel, and made all the deck gear forward from parts out of a watch. The only parts he bought were the guardrail stanchions. The model has a custom glass case made by dockyard workers at Portland Naval Base, who were so impressed when they saw the model screwed to the desk in his cabin that they just turned to and built the case for him. Site visitor Jenny Pearce reports that her grandmother, Amy Cotterell, launched HMS Lasso at the Woolston Works of Messrs J.I. Thornycroft, Southampton, on 17 March 1938. Mrs Cotterell was the wife of Charles Ernest Cotterell, the local manager of the Cunard White Star Line. The launching ceremony was reported in the Southern Daily Echo, Southampton, in its issue of that date. 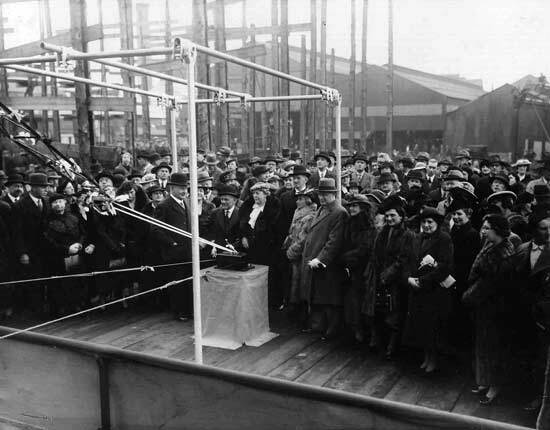 The photographs of the launch ceremony were issued as publicity shots by Thornycrofts at the time, and, together with the text of the article, appear here courtesy of Jenny Pearce. While the ship’s name is recorded as “Lasso” in other references, the Echo has it as “Lassoo”; the paper also inserts an extra "e" into Thornycroft. The Lassoo is not the largest ship Messrs. Thorneycroft have in the yard at the present time, but she is a very important one. The job she has to fulfil is one concerning which details are not being divulged, but evidence that they are important duties may be gathered from the names of her officers - distinguished names in the Royal Navy. "These officers would not have been chosen unless the Lassoo had important work to do, not only in home waters, but in far distant seas"These remarks were made by Sir John Thorneycroft, K.B.E. (chairman of Messrs J.I.Thorneycroft and Co., Ltd.) yesterday at the lunch which followed the launch of H.M.S. Lassoo at Woolston. The Lassoo, described as a cable-laying vessel, is designed to act as tender to the anti-Submarine School, Portland. Sir John submitted the toast of the King, and the company also drank to the success of the Lassoo. Mrs Cotterell, wife of the local manager of the Cunard White Star Line, who had performed the namaing ceremony, replied and said how much she appreciated the great honour which had been conferred upon her in asking her to perform the launching ceremony and expressed thanks for the beautiful souvenir of the occasion which, she added, would always be treasured by her and her family. 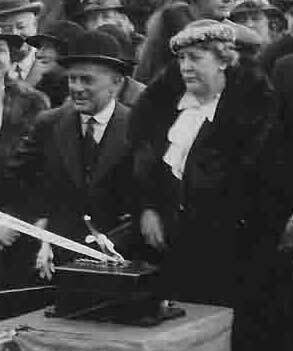 Charles Cotterell next to her in the bowler hat. 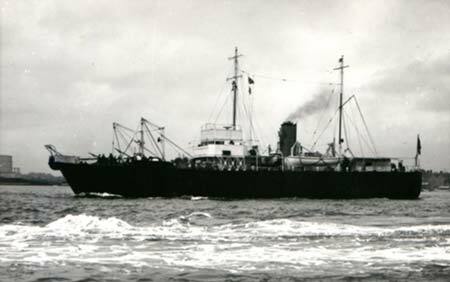 Mrs Cotterell wished the builders continued success, congratulated the men responsible for the design and construction of the Lassoo and in conclusion expressed the hope that she would be a happy ship, and would long continue in the service for which she was intended. Mr C.E.Cotterell also returned thanks and, referring to the “hush-hush” nature of the ship which his wife had launched, remarked that he was sure the Admiralty were going to get a good job, because Thorneycroft was a household name, particularly in regard to the construction of vessels of specialised type. They had been constructing specialised vessels for years past, and it was significant that when special craft were needed the Woolston firm not infrequently secured the orders. 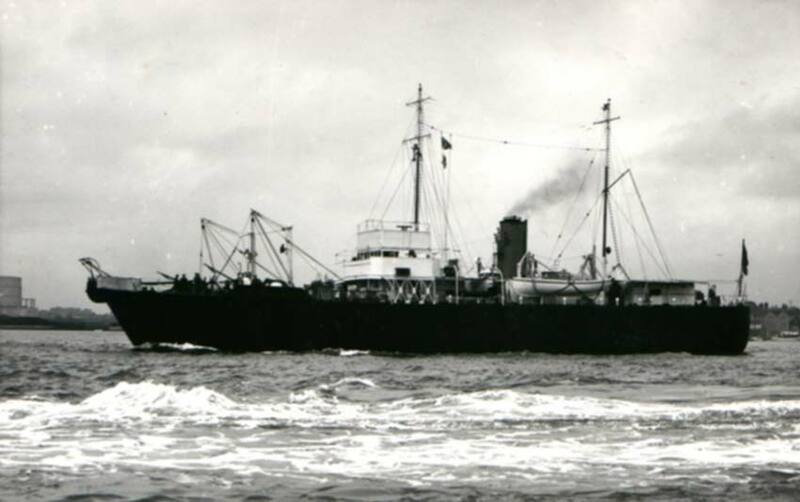 As one who was connected with large Atlantic liners, he could speak with confidence of the work accomplished by Thorneycrofts. 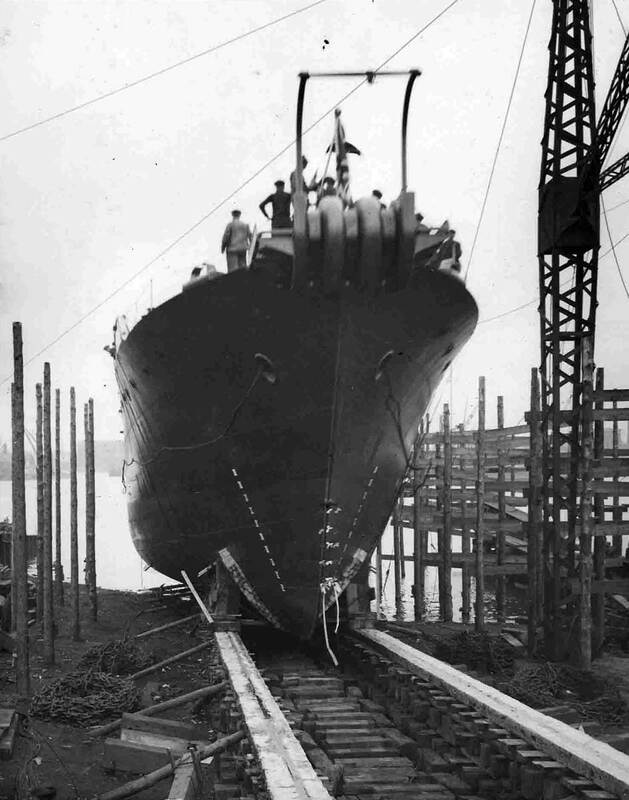 In addition to the extensive shipbuilding works, the firm had a large repair establishment in Southampton Docks. That establishment was well equipped and essentially up-to-date. For obvious reasons, Thorneycrofts did not build Queen Marys or Aquetanias, but they did play an important part in maintaining such ships. Large ships, when completed, seldom returned to the place of their birth. That meant that they had to be manicured and attended to in the place from which they operated. That was where Thorneycrofts came in, for, with their efficient repair shop and the resources of the Woolston yard, they were in a unique position to deal with any difficulties which might arise. since they had started carrying out the work of the Cunard Line, nearly 20 years ago, they had on occasion been confronted with difficult problems, some of which had not arisen before, yet they had solved them all. “You can imagine” proceeded Mr Cotterell, “that when a vessel of 80,000 tons and 200,000 horsepower spends only a few hours in port the standard of efficiency required to enable an express service to be carried out is very high indeed”. Mr Cotterell spoke in admiration of Mr Thorneycroft Donaldson (director and general manager of Woolston Works), who enjoyed the respect of everyone and went on to pay tribute to the foremen and workmen of Thorneycrofts for the high standard of craftsman ship they maintained all the year round. Vice-Admiral Skelton submitted the toast of “Our Guests” and referrred with pleasure to the presence of the Mayor and Mayoress, distinguished representatives of the Royal Navy and Admiralty, together with those of the Merchant Navy and their friend Sir Rssell Bencraft, known to all people in Southampton, and Lady Bencraft. Concluding, the speaker said that everyone was gratified at the presence of Captain Gorton, who was to command the Lassoo upon her completion. The Mayor, who replied, returned thanks for the hospitality exteended, and said that he was deeply interested in the firm of Thorneycrofts. At the present time between 2,000 and 3,000 workmen were engaged in the Woolston yard, and it was not difficult to visualise what that meant to the town. He was pleased to learn that the firm were engaged upon commercial as well as Admiralty work, and tht present contracts would keep them busy for a year or two. Mr Thorneycroft Donaldson, in thanking the Mayor and the other speakers, for their kind remarks about the firm, said that Thorneycrofts appreciated the standard of craftsmanship of their employees. Mrs Donaldson [sic], who remarked that she had a 30 year association with the firm, also responded. Mrs Cotterell presided at the luncheon, and she was supported by Mr C.E.Cotterell, J.P., the Mayor and Mayoress of Southampton (Councillor and Mrs G.E.H. Prince), Sir J.E.Thorneycroft, K.B.E., (chairman of Messrs. J.I.Thorneycroft and Co., Ltd.) and Lady Thorneycroft, Engineer-Vice-Admiral Sir Reginald Skelton, K.C.B., and Lady Skelton, Sir Russell Bencraft, J.P., amd Lady Bencraft, Vice Admiral L.W. Braithwaite, C.M.G., Captain Sir Arthur H. Rostron, Alderman Ssidney Kimber, J.P., and Lady Kimber, Engineer-Comdr. and Mrs Sylvio Weguelin de Abreu, Captain S.G. Gorton, M.B.E. (who is to command H.M.S. Lassoo), and Mrs Gorton, Mr J. Maughfling (financial director of John I. Thorneycroft and Co., Ltd.) amd Mrs Maughfling, Mr A.W. Watson M.B.E (Assistant Director of the Naval Construction Department), Mr Thorneycroft Donaldson (Director and General Manager, Woolston Works) and Mrs T. Donaldson, J.P., the Town Clerk of Southampton (Mr R.R..H. Meggeson) and Mrs Meggeson, Mr R.P. Biddle (Docks and Marine Manager, Southern Railway) and Mrs. Biddle, Captain W.H. Whittle, O.B.E. (Principal Officer, Board of Trade), and Mrs Whittle, Captain J.V. Forster, O.B.E., (General Agent, Canadian Steamships Ltd.), and Miss Forster, Mr C.J. Sharp, J.P.(Chairman, Red Funnel Line) and Mrs R. Mackie. The cable sheaves may be seen at the stern.